If you are extremely rich and you know you’re going to die soon, what will you do with your money? Would you “make the most” of your wealth and spend it all while you still can? Or will you use it to do some good? 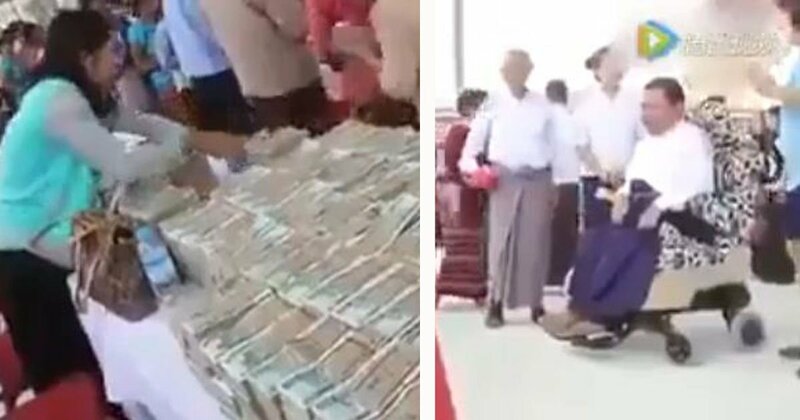 The video below shared on Facebook by the Danified page tells us that a dying billionaire from Myanmar decided to do the noble thing – which is to distribute his wealth to the poor since, you know, he can’t take it with him to the afterlife. The short video shows several men distributing cash to people who fell in line. Meanwhile a man, wearing a white shirt and visibly ill, can be seen sitting on a chair. Some of the recipients of the rich man’s generosity bowed down to him to express gratitude. The footage immediately went viral shortly after it was posted on social media. Netizens everywhere have been praising the man for having a good heart. Some even pointed out that this totally dispels the notion that most rich people are naturally greedy. According to a report by Buzzflare, the billionaire’s identity remains undisclosed so far. His full name, along with the exact location of where the footage was taken, is still unknown as of the moment. Their headline, however, mentioned that the man’s motivation for doing the deed was because he believes he can’t take his wealth with him to the afterlife. So what do you think of this, guys? Would you do the same thing if you were in this rich man’s position? Or would you do it differently? Don’t forget to leave a comment below and tell us about it. Uber nyinyioo myanmar ,my billionaires myanmar in the house.